1 Heat the oven to 180°C (160°C in a fan oven), 350°F, gas 4. 2 Rub the goose with salt and ground black pepper on the inside and outside. Stuff 2/3 of the apples, the cranberries and herbs inside the goose and sew the cavity closed using kitchen twine. 3 Place the goose in a roasting tin with the breast down, add 100 ml water, cover and roast for 1 hour 15 minutes. Baste occasionally and add some more hot water if necessary. 4 Then turn the goose over, pierce with toothpicks under the wings, arrange the remaining apples along the sides and roast uncovered for a further 90 minutes, basting more often. 5 Brush the goose with salt water, turn the oven up to 200°C (180°C in a fan oven), 400°F, gas 6 and continue to roast for 10-15 minutes until crispy. 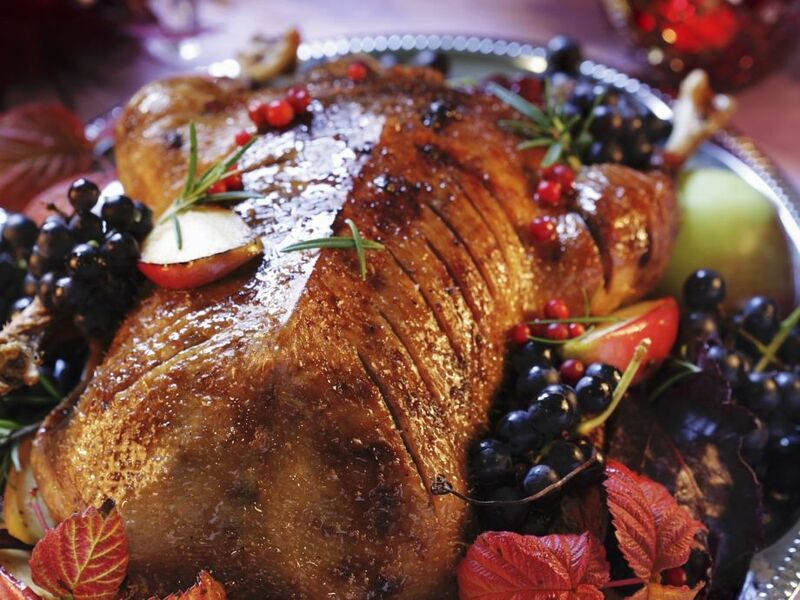 6 Remove the goose from the oven, carve and arrange on a serving platter with the braised apples. (If desired garnish with grapes and vine leaves). Skim the fat off the sauce and season to taste.